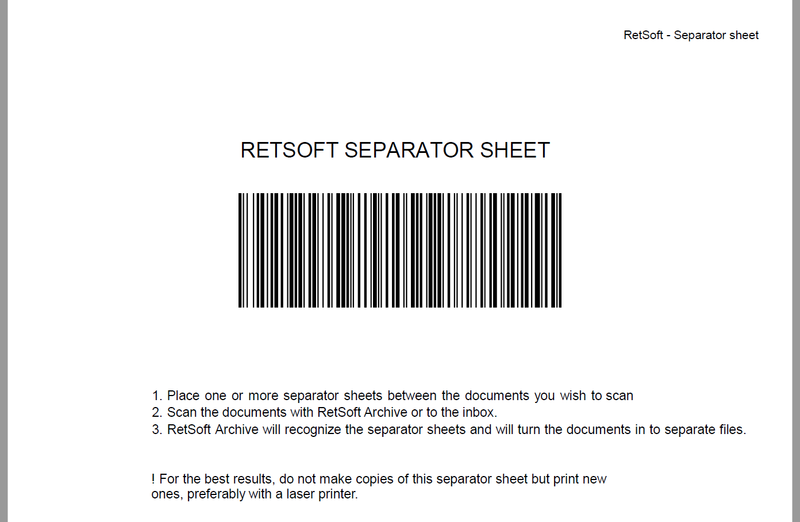 If you have multiple documents you need to scan and you don’t want to start individual scan sessions to scan each separate document you can use our RetSoft Separator Sheets. This function is only useful when your scanner has an ADF, an automatic document feeder. After printing a couple of RetSoft Separator Sheets you place them in between document sets. RetSoft will search for the barcodes after each scan session, if a barcode is found RetSoft will then create a new document for the pages after the barcode. These barcodes can be used again and again if you remove them from the scan batch after scanning. To make them easily recognizable we recommend printing them on slightly colored paper. Click on the barcode button to print new separator sheets. © 2018 - RetSoft B.V.